No matter how careful you are when driving, you are likely to have an accident at some point in your life. You just can’t control what other drivers do, and you can be involved in an accident even if you are following all the rules. It’s important that you prepare yourself so that you know what to do in case of an accident in Mesa, rather than put yourself at risk because you don’t know what to do since you refused to admit it as a possibility. As soon as you are able to, you need to call 911. Whether you have a minor or a major accident, you will need the police to show up and document what has happened. Providing your insurance company with a police report will make the claims process go a little easier. In a major accident, it will be essential that you have the information from the police investigation to recover damages. If you have been in a major accident, you will also need to request an ambulance. Even if no one appears to be seriously injured, you should have medical professionals check everyone out to ensure that there are no potential problems. For example, someone could have internal bleeding or a concussion, and no one would ever know it. Even if you are in a minor accident, you should consider having an ambulance come to get everyone checked out just to be on the safe side. You will both give your information to the police, including your name, address, and insurance information. However, it could take you a bit to get a copy of the police report. Make sure you ask the other driver for their information on the scene so that you can move forward with filing your claim right away. Then you won’t get delayed by waiting for the report. If you were involved in a minor fender bender, you may decide that you don’t even need to call the police to investigate the situation. In that case, make sure that you at least ask the person for their details, including name, address, phone number, insurance information, driver’s license number, and automobile information. You will need all of this to give to your insurance company. Insurance adjustors will need to see the damage to your vehicle to know what to pay you for damages – or what to pay the other driver. Taking photos of the damage will capture evidence of the state of both vehicles at the time of the accident. These photos can be used to prove the damage to your vehicle, as well as to prove that there were no additional damages to the other vehicle. Typically, police will take their own photos, though they may not if it was a minor accident. Having these photos will protect you if police did not take them. But even if police did take photos, taking your own will further protect you – and may even show additional angles that are needed. 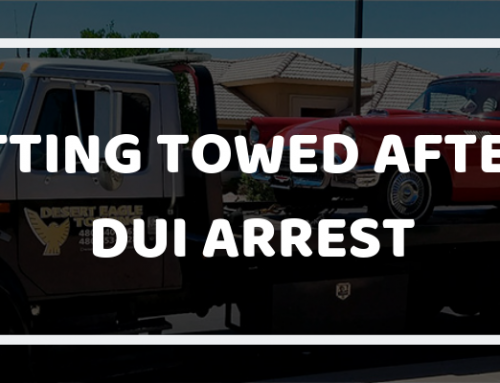 When police arrive on the scene, they will typically offer to call a tow truck for you if you are not able to drive the vehicle. However, you may not like the Mesa towing company that the police call. So you may decide that you want to call a tow truck for yourself. Research the local options to determine the best towing company to call, and then program the number in your phone. Don’t wait until you’re on the scene of an accident and are feeling stressed and emotional to do that research. You’ll make a quick choice that you might not like. You should call your insurance company as soon as you can after the accident – even right after you get home. The sooner you call, the sooner you can begin the claims process that will get your car repaired and get you reimbursed for medical bills or damages. By calling your insurance company quickly, you also reduce the chances that you will forget any important details from the accident. Of course, one of your first thoughts after you have had the accident – assuming you are not injured and neither is anyone else – will be to get your vehicle repaired. You’ll need to take your vehicle to an auto body shop near Mesa to get an estimate for the damages. Your insurance company might provide a list of shops they work with, but you should be able to get the estimate from any shop at any time. The quicker you get the estimate from the body shop, the quicker you can get your vehicle repaired. By taking the proper steps after an accident, you can protect yourself against losses. You can ensure that everyone gets proper medical treatment first, and then you can ensure that the damages to your vehicle are properly documented and that you are properly reimbursed. If you have been in an accident in Mesa, AZ, call Excel Collision and Glass Centers to get an estimate for the damages. We are the auto body shop that Mesa, AZ residents trust, and we work on all types of automobiles. We are used to working with many major insurance companies, so we can help you through the process. Call us today to schedule your estimate!